New research from MIT’s David Autor has set the economics profession on fire in recent months. The reason is it furthers our understanding of the impacts of job polarization, wage stagnation and the implications this has on migration and the urban-rural divide. What follows is a summary of his new research through a Pacific Northwest lens. A generation ago, workers of all stripes earned higher wages in large, urban areas. There was an economic incentive for individuals to move to cities. Workers responded accordingly and our metro regions have thrived. However, in recent decades there has been a decline in these types of jobs due to job polarization. As is well known, these changes have impacted traditional blue-collar, male dominated occupations like production — the manufacturing jobs that actually do the manufacturing. However it impacts women to the same degree due to the loss of office support jobs. These shifts can largely be traced to automation and technological change, however Autor notes that offshoring, erosion of bargaining power, falling real minimum wages, and the fissuring of the workplace also play a role. The problem with job polarization is not just the loss of a middle-wage job, it’s when that worker is unable to land a similar paying job in its place. Autor’s research finds that “almost all occupational change among non-college workers reflects a movement from the middle toward the bottom of the occupational distribution.” This is in-line with what we found HERE and HERE in Oregon as well. These adjustments are disheartening as most Oregonians either end up taking a low-wage job or drop out the labor force entirely (1/3 of women, up to 2/3 of men). Autor writes that this process depresses wages in two ways. First, by taking a low-wage job, a worker simply earns less. Second, the labor pool is larger and as the supply of potential workers outstrips demand, the price (wage) falls. The result is that workers today without a college degree perform the same tasks in urban areas as they do in more rural areas. As such, they are paid the same relative wages. A high school graduate working in Pendleton or Sequim earns the same as their counterpart in Portland or Seattle. There is no longer an urban wage premium for workers without a college degree. All of this before housing and the cost of living are taken into account. Note: The data are based on PUMAs and the horizontal axis shows population on a log scale. Neither of these are intuitive. But as you move left to right on the horizontal axis you go from rural areas to urban ones. For some context, all of Eastern Oregon and Eastern Washington (ex Tri-Cities and Spokane) are in the 1-3 range. Boise, Eugene, and Medford are around 4. The Portland and Seattle areas are 5+. So what are the implications of these changes to the economy and will these trends reverse? Well, without a financial incentive, workers without a college degree will continue to move to urban areas less frequently. This reduces the relative labor supply in cities, placing more pressure on firms looking to fill low-wage jobs. In the past year or two we have seen a big rise in employment rates for individuals with a high school diploma or less and wages are rising the fastest at the lower end of the spectrum. Conversely this shift raises labor supply in smaller metros and rural areas, supporting stronger overall growth in these locations. This sorting by job opportunities, educational attainment and the like is not complete, but is ongoing. The combination of high housing costs and low wages, or low-wage opportunities drives much of it. The economy is searching for a new equilibrium. As Marginal Revolution‘s Alex Tabarrok points out some of these changes are endogenous. That is, firms who do not have be located in expensive urban areas have located elsewhere, hence some of the decline. Autor points this out as well and highlights that manufacturing jobs have shifted out of cities into suburbs and other areas as transportation networks improved. 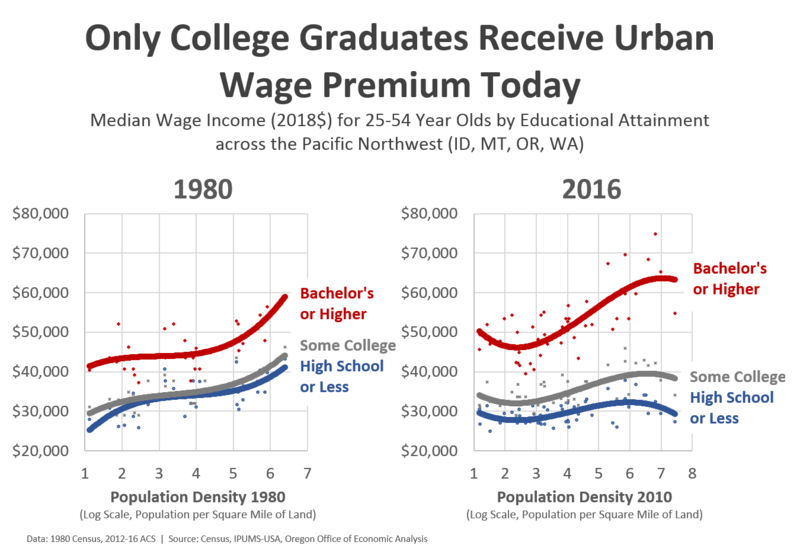 But for now these trends point toward young college graduates continuing to drive population growth in Portland and Seattle, while the other regions in the Pacific Northwest should see more balanced gains. Finally, I must note that Autor himself calls for further research into these processes and findings. He provides strong evidence of the likely dynamics behind these trends, but does not say this is the only possibility. In particular an occupation is not a labor market. Urban areas are not truly independent of rural ones. Everything is interconnected. Just because demand for one type of work or in one location declines, it does not necessarily mean it hampers trends across the entire economy. Given how relevant this research is to many different policy areas, I suspect we will see lots of papers fleshing out this research in the coming years. Bottom Line: Obviously we, as a society, have know about some of these dynamics for a long time. What is new is how Autor combines these insights to look at how job polarization and geography meet, overlap, and intertwine. What he finds is highly informative and can largely explain big picture trends in recent decades. As such, the research is also depressing. The good news is that a strong economy does work wonders, even if does not cure all ills. Job polarization is most evident in recession. During expansions, middle-wage jobs do grow, particularly those driven by population gains, but they do not fully regain their share of the labor market. What about the leveling off or slight decline in wages for those with a bachelors degree on 2016? Seems yes there is a marked wage premium but there is still stagnation in wages at the higher educational attainment was well. It will be interesting to see how this data changes beyond 2010. You’re right Mark. There is some growth for college graduates but it isn’t strong everywhere (unlike for high school grads where it’s been flat or negative everywhere). In earlier work, average wages for college graduates in Oregon have been relatively flat since 2000 after adjusting for inflation. But the past few years have brought wage growth across the board, so updating this in another couple of years may reveal somewhat better outcomes. Horizontal axis on chart is not intuitive, would help to know where some small towns and large cities fall along that log axis. Thanks Bill. You’re right. Log scales are not intuitive, plus the data are PUMAs or groups of PUMAs which also aren’t intuitive. Overall though that’s partly the point that it’s not about specific places as it is about the big picture changes. That said I’ll add a comment. Basically, all of Eastern Oregon and Eastern Washington (except Tri-Cities and Spokane) are 1-3. Urban areas are all 4+. The Boise, Eugene, Medford around 4. Portland and Seattle areas 5-7.